One of the biggest obstacles to the implementation of HR software is the presumed complexity of the technology. 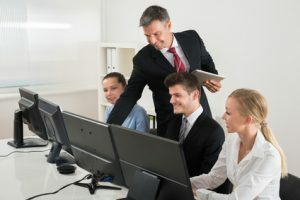 For many human resource managers and other decision-makers, HR systems might prove prohibitively difficult to learn and operate with the necessary proficiency. Foremost on the minds of these managers is the question — Will users learn and adapt to the new system within a reasonable timeframe? While the introduction of any new software implies a transitional phase, these normal learning periods needn’t be extraordinarily time-consuming. In fact, by and large, many HR systems boast a favorable user-friendliness that greatly minimizes the learning period. Well-designed HR systems generally create a highly-favorable user experience. Intimidating complexity has been engineered out of the technology and replaced by a friendly interface conducive to user comfort and efficient adaptability. Of course, skeptics will need a further push in the right direction. Fortunately, managers can sample the merchandise to eliminate any lingering doubts. For their benefit, decision makers can avail themselves of demo systems to ensure the product’s suitability for their enterprise. Typically, these decision makers will discover a favorable, user-friendly intuitiveness built into the technology. This intuitiveness, of course, characterizes the actual product once implemented. The upshot of intuitive design is a significant reduction in required user training. Typically, management and other personnel can harness much of this paperless technology’s power unassisted. Should questions arise or instruction be needed, management likely won’t be forced into time-consuming searches for solutions. HR software providers generally offer substantial customer care resources to provide transitional solutions. If you have any questions about transitioning to a new HR system, please reach out HRsoftware.ME. Our team will be happy to provide additional information and answers to all your questions.